The van was clean and in great condition. 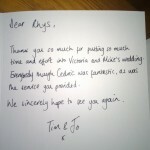 It made a massive difference to our wedding and was one of the focal points of the day. Plus it looks great! Cedric was fantastic, as was the service you provided. Catherine and Russell (9/25/2013) - Hugest thank you's to you and Sam for making our day super special - you are such 'can do chaps', totally unflappable with a super friendly manner. A personal thank you for all your help and advice prior to the day. Holly & Alex (9/15/2013) - We can't thank you enough for being part of our special day, we have had such amazing feedback about the van and how everyone just loved everything about it. Our friends tried to book you for next year but I believe you are already booked up. Chloe & Steve (8/25/2013) - Thank you so much for being part of our special day. Everybody loved Cedric and he was a perfect addition to the reception. A big thanks again for all your hard work and excellent service. Sammy & Jess (6/25/2013) - Just wanted to say a MASSIVE thank you for everything over the weekend you guys absolutely rocked! All of our family and friends have been raving about you! My uncle also emailed me today singing your praises we couldn't thank you enough and I know you went above and beyond and we are very thankful. Katie & Jamie (6/22/2013) - A huge, gigantic thank you for last weekend. I think people are going to be talking about the jager-moo van for a while yet!! Thanks so much for everything - Cedric looked just amazing and having you guys there definitely made the night and got the party going!